Your company should be selling digital advertising delivered through your web site, email, social media, webinar, digital edition. Here is the place to learn how. 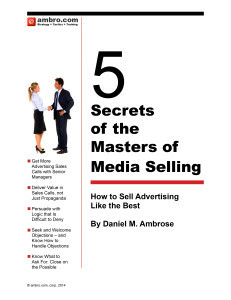 Ambro.com has been training sales people in selling “new media” since VCRs were new media. We understand all forms of digital media and can explain it to your sales staff in easy language and with examples they can digest. Introduce your sales team to internet and mobile media advertising in terms they will understand, not the jargon you get from other trainers. Show your sales team how value is delivered in digital media so they have confidence in selling to their clients. Teach your sales team the common research and audience measurement forms that are used in digital sales. Contact Us for more information on Digital Media sales training.